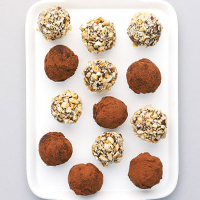 Treat mom to these delicious truffles full of dark chocolate and nuts. Break 200g dark chocolate into a large bowl and add 30g unsalted, room temperature butter. Heat 142ml pot double cream until steaming, then add 50ml Irish cream liqueur. Pour the warm cream over the chocolate and stir until melted. If the chocolate is not fully melted, you can place the bowl over a pan of simmering water for 20 seconds. Fold in 50g roasted, chopped, blanched hazelnuts. Chill for 3 hours or overnight. Once set, scoop up the mixture in rounded teaspoonfuls and roll by hand to form balls. Have one plate ready with 30g cocoa and one plate with 30g chopped hazelnuts. Roll half the truffles in the powder to coat, and half in the nuts.